Last month we were analyzing the Domino environment of a US based oil company, together with IBM. People within this company were complaining about slow performance of the environment. We noticed that many users within this company had mail files that were very (if not extremely) large. The CIO of this company asked me a smart question: What is the Norm? Having analyzed more than a million users (and mail files) we decided to develop a benchmark. Here it is, and I think it looks awesome. 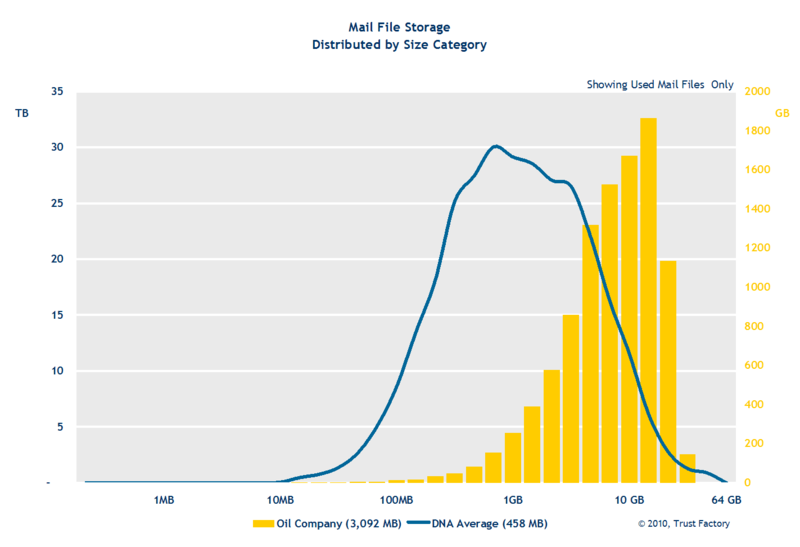 Notice how the distribution of mail file storage for this oil company is leaning far more to the right than the DNA average is showing. 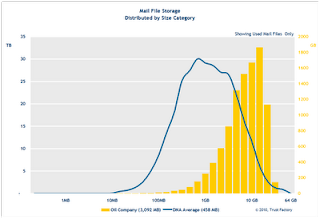 The chart is plotting total storage consumption (vertical axes) for Lotus Notes end user mail files, distributed by size category (horizontal axis). The size category is plotted in a somewhat logarithmic scale for visibility purposes. The Blue line shows the distribution for all our other DNA customers (left vertical axis). The Yellow bars show how mail files are distributed for this oil company (right vertical axis). Does this benchmark answer the question of the customer, showing what the norm is? I think it does, from a visual perspective so that managers see this too. My colleague Erik Vos produced the statistical method for defining these norms, and this is now embedded into our DNA data warehouse.